Where exactly we have to dig the Water bore well in our house, Which place is suitable for the water body source, vastu for the underground water tank, most of the doubts may have answered here. A Water Bore Well or water sump or Water Tank or Pit (Water Body or Water source) should be dug (we will also discuss earth wire pit or earth wire well)after performing proper pooja's. Deep wells are considered good. The water available in a deep well will be pure and rich in minerals. The slow-moving water body or fountain in front of the house is very auspicious. 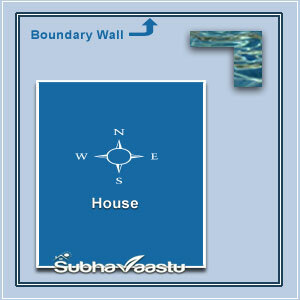 It is a vastu principle that well should be in the Northeast of every house. That may be eastern northeast or northern Northeast. Utmost caution should be shown in regard to well or bore well. The shape of the well can be a square or round below the ground, but it should be round on surface. If it is a square, one of the four angles will cause a thrust to the house. The shape of the platform of the well should be less elevated than the plinth level of the house and ground level of the area in Southwest. The platform should not touch the Eastern or Northern compound walls. A well has to be dug in the area as per Vaastu. A well or bore well should not be dug on the diagonal line proceeding from the northeastern corner of a house to the northeastern tip of the plot. It should be located either to the right or to the left of the line as per the availability of space in the east or north of the northeastern portion of the plot under no circumstances should a well or bore well be in the angle of the northeast. If there is a pump set in the northeast, it should have roof. This should not touch north or east walls. If well or bore well or any pit is situated in the northern north east the family will be happy, will prosper, and have sound finances and enjoy these benefits for many generations. The situation of well or bore well in eastern northeast will make the master of the house famous along with bestowing the above benefits. Some sink well or bore well near the house adjoining it, thinking that it is in northeast anyway. (This matter is came from www.subhavaastu.com) But it is wrong. The well or bore well should be in the northeast for the entire plot or area. In some cases there are meager chances of digging or drilling a well or bore well. In such cases they can be had in the east. “A well in the east – all good omens feast”. A well in the north is also good. Well in the north all benefits will be brought forth. This will bless womenfolk. 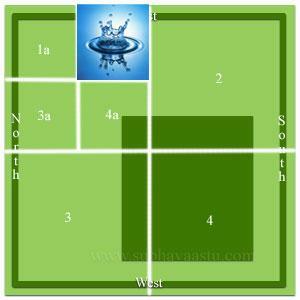 See these designs of wells as per vastu. A well or bore well in the south is strictly forbidden. It will lead to the untimely death of women. No well or bore well in the west should be there. Check about retention ponds at West directions. The resident will become diseased and incurs financial losses. A well or pit in eastern south-east will result in the ill health of the matter of the house and children. Further, it may cause fire accidents and thefts. By a well in Southern south-east, women will fall sick, incur financial losses, fall into bad habits and there will be the threat of fire accidents and thefts. If there is a well or pit in the Southern south-west, the women, folk suffer from terrible ill health. There will be a loss of money. There will be indebtedness. They meet the premature death. If any well or pit is there in the Western south-west, the landlord will suffer from chronic diseases and they become bad characters. They may meet an untimely death. A well or a pit in Western Northwest will affect the men. They will be bad characters, they suffer financial losses, court litigation, and thefts. They will have no peace of mind. If there is a well or pit in northern northwest enmity will increase, women will have no mental peace or they may leave the house and such undesirable things come up. Some people cite irrelevant matters from ancient books and support the incongruous points as standard in their books. It is a tested and proved point that it is better for the site of construction to be more in the west than in the east and south more elevated than in the north. But some contemporary writes on Vaastu suggest that wells or bore wells should be sunk in east, north east or north or even in west by citing old treatises like Kalamrita, Vasishta, Smahita, Sanathakumara vasthu and "Vaastuchintamani". It is cited in them the places that the well or bore would be in east, north, northeast and west. But a well in the west does cause a pit there. So suggesting that a thing is bad in some places and the same thing as good in some places is self-contradictory. (this matter from www.subhavaastu.com) How should one understand this? We come across such incongruous arguments in some books. The argument that Varuna is the lord of the west and so a well can find place there is meaningless. Suppose a well or a bore well or undesirable pits are there in wrong directions, it is inevitable that they should be closed and covered. But some people cover a cement slab on a well to close it. Someplace wooden bars on the well and cover it with earth. But it is wrong to cover the surface without filling the inside with earth or other material. They should be filled with earth or other material and then covered with slabs. But there will be a gap in them with the passage of time. Then again it should be filled and covered. Observe this flash file, here the house is at Nairuthi (Southwest) corner, and the Water sump with round shape has came into East Eshan (Northeast) corner of the Compound corner, results will be good health, richness, name and fame. There is one red line running from house to compound wall corner, that means we should not construct the water sump in that place. We have to left that place and construct the water sump at East-Northeast place or Northeast place. 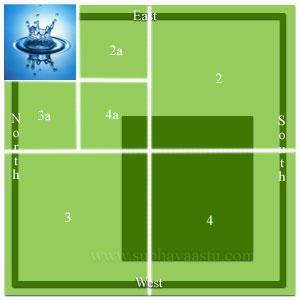 There are some other places for water sump, those are Eshan, East, and north sides, before constructing water sump at East and North sides please get a right suggestion from one experienced vastu consultant. Observe the below images, from this you may understand why we should not dig the water sump at Northeast corner exactly, this explanation can able to gives you the clarification. Here the sump shape has changed, actually, this shape of sump may be good, but here it is not recommended. In the above image the distance between house and compound wall has changed, due to this spacious place in the compound we may take a decision to dig the water sump at the northeast corner. The distance will save the construction. Here the water sump shape has changed, here also you can decide to dig the sump like this, there is a lot of distance in between the house and compound wall. In the above image, we can clearly observe the distance in between the house and compound corner, so there may not be any damage to the construction, due to this idea, we may dig sump at Northeast corner as discussed in above two images. In the above image we can clearly observe a less distance in between the house and compound wall. So it is not recommended to construct or dig any water sumps in northeast corners. That will be damage to the construction. If the construction is not so secured, bad vaasthu power will raises. 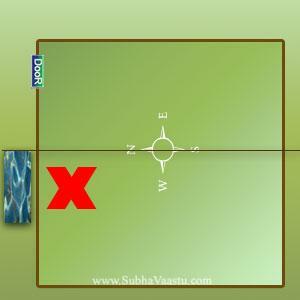 So consult one expert vastu consultant before ordering to dig your house, it may damage to your pocket also. After all observations in the above images, it is suggested that without taking any risks, it is better to have the water sump as shown in the above image. But any how its better to consult a competent vaasthu scholar before doing any job in your sweet home. 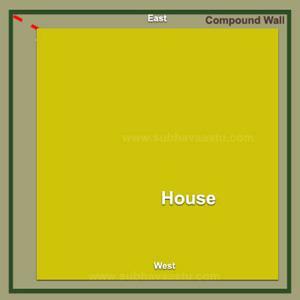 The above image is a one house with compound wall, now we are going to make it 4 parts of this property for water sump purpose, this will helps us to know some more information on this Vastu science. After making 4 parts of the entire property, then we can easily understand where the sump has to come and what the logic to dig a water sump towards northeast corner. Please observe the house sitting position in the compound wall and the empty space inside the compound wall. Observe the center point of the compound wall with white marks here. This is the right position to evaluate the center point or four parts of the house. "1" represents Northeast corner of the compound wall. "2" represents Southeast corner of the compound wall. "3" represents Northwest part of the compound wall. "4" represents Southwest part of the Compound wall. This is the exact evaluation of parts of the compound wall. Because the residents of this property have rights on the house and compound wall, and both are under one owner (resident) only. Now we will check up where the sump has to come and which is the best position here to have or dig the sump here. Now we are going to dig a sump at northeast corner i.e., "1" in the above image. Now again make it 4 parts of the northeast corner. Now we have done again 4 parts of the "1" i.e., northeast corner of the compound wall. Here the northeast part of the northeast corner namely "1a" , Southeast part of the northeast corner i.e., "2a", Northwest part of the northeast corner i.e., "3a", southwest part of the northeast corner i.e., "4a". Now we got the exact corner to have sump here. The "1a" is the exact position to dig the sump in any part of the property, but there are some more relaxation in some other properties that we will discuss later. Here "2a" and "3a" is also suitable to dig the sump. If residents will dig the sump at "1a " here that means the water is at exactly towards northeast corner of the compound wall, an Auspicious alteration done at this house. Now Water sump or water body has came into northeast part of the northeast corner of the compound. This is the exact water sump placement at house. Still there are certain in-depth rules to have water sump here. We will learn all the things here. Any way we reached the exact position of the water sump in a house with compound wall. Here the water sump or water body has came into Southeast part of the northeast corner of the compound wall. This is also a good position. There is nothing to worry about placement of water sump or water body here. Here the water sump or water body has placed at northwest part of northeast corner of the compound wall. This method is also good, there is nothing to worry about this placement. Now we will check out what is the position if the water sump has came into Southwest part of the northeast corner of a compound wall. Here water sump placed towards Southwest part of the Northeast corner of the compound wall. Anyway, as per the above image, this water sump has come towards the Northeast corner in the entire compound wall. But here the "Aya" is too important while constructing the water sump exactly towards Southwest part of the northeast corner of the compound wall. This sump is almost adjacent to Plinth area. Now observe a small graph type water sump or water storage places in our properties. The entire northeast is marked as white area and red occupied gradually towards southwest area. It indicates that the southwest parts are not good for water sumps. Along with this direction the south, west, northwest and southeast portions and finally the middle part (Brahmasthan) areas we should not construct the water sumps. Here the entire East is clear with white mark or marked with white in colour and gradually red occupied the entire west part, so the water sump is suitable at entire East here, but it should be finalized by vastu expert only, residents should not take any decision. 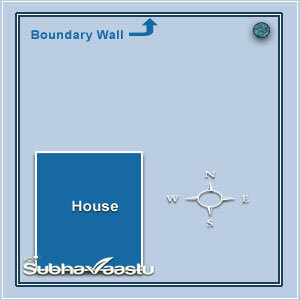 Here the entire North is clear with white mark or marked with white in colour, so the water sump is suitable at entire North here and gradually red occupied the entire South part, but this method of construction should be finalized by vaasthu expert only, residents should not take any decision in the absence of Vastu Expert. The above graph indicates the Water storage excellent levels or danger levels in a property White areas marked are excellent in results and red areas are dangerous, regarding north and east total white areas, without expert vastu consultant one should not do construct these directions places as entire water sump area. 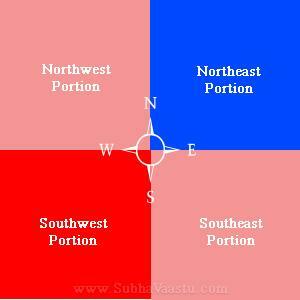 It should be personally verified by the expert vastu consultant and after that only decision has to be taken. Please note that this is approximate levels, it is not prepared according to scale. The water storage comes to up and downs in a property, so before going to do any alteration in a property please approach one expert vastu consultant and obtain his guidance. Once mistake happens in the name of this dig or drill in a property, it may causes to mental tensions and money loss to rectify the same. Regarding the results already we shown it with red mark. For your kind information, here is a map showing that the red and blue colors for water tank. Red color area is not suitable for water tank and the blue color area is the water tank area. Some areas both colors are mixed, if you would like to construct the water tank in that area, it is better to approach one expert vaastu consultant and get right recommendation after showing the property. Blue colour is the right portion for water sump or tank. But it should not reach the Southwest area, or it should not reach the Southwest area. The red area which is Southwest area "NO" to water sump or Water tank. The Northwest areas and Southeast areas are also not recommended for the water sump or water tanks. Generally, the Southwest water body may makes vandalism or deliberate destruction of the entire enterprise. Particularly this Southwest has a protagonist part in the destruction when water situated under the ground level. The best action here is close this Southwest and open at Northeast then can able to resilient in their common situation or can feel like find out trove there. We strongly hope that these cues may makes residents more relax. Here we are discussing about the water tank or water sump which is water storage in the ground, we are not discussing about the water tanks above ground levels. Please note this point. One property with having full of water sump at East side. The property is rectangular property, which is having 60 X 100 .. in this property the plinth area is 40X40 with duplex house and having total 5 bedrooms. The residents are more healthy and wealthy, these property owners taken experts opinion after showing this plot. Here you may please observe the water sump at East Direction, almost entire east direction is water storage sump. These residents require heavy water storage sump, it is in Rajasthan. 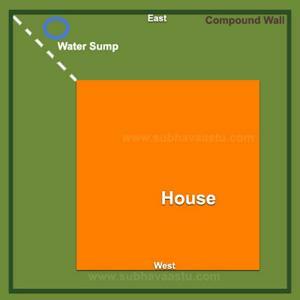 If the property is rectangular then we can try to have a large water storage sump at entire east sides, but it should be done in the presence of expert vastu consultant. Why because if there is any street focus / veedhi drishi / sula is hitting the property that to northeast east or northeast or east focus and here the directions say about North, South, East, West are also taken into consideration for doing the methos of construction style, otherwise this entire sump may not be advised. I have bore well in NE corner. Can balcony of the house covers over the bore well ? The balcony is projected towards both sides of the North & East with a little margin to compound walls sir. Please suggest me the correct way before casting the slab ? A bore well is for humans utilization purposes. After digging the earth for water, when water is detected and got good water, then Plumber will cover it with casing pipe with motor provided along with pipes. So it will be covered with full protection. Now coming into the point that, why we should not walk on water wells, bore wells, water sumps etc. In olden days antibiotics are not available easily, and if something poured on water, cleaning means not so easy, that is why our elders strictly ruled out a new thing that we should not walk on water, it means we are giving respect to water (water is nothing but God symbol as per Hindu system), on those days cleaning means they clean the water with a cloth or heat the water and consuming. You are well aware that most of the deceases spread with water. Nowadays in a small village and a small street also we can avail of antibiotics, and many new systems came to clean the water and many of us are consuming mineral water and this is very general thing. Based on this we may not be serious on this issue and we can have sump under the portico. But still our elders or Pracheena /Prachin vastu scholars never accept this system. Now everything is covered and no way to get that water source spoiled with dust, if so we are drinking only purified water only. This is a scientific reason. Another reason also there, water source means depression, so children may fall into that deep routes, that may be another reason for our elders not to walk on this water body. Excellent and grateful thought. Our elders always think on our health and wealth. Salutes to our elders. I have a East facing 35 * 40 feet plot. And I am constructing house in that plot. Now I am planning to dig a sump in front of the house (in North-east portion the plot). Exact location of sump is between east wall of the house and east wall of the compound. 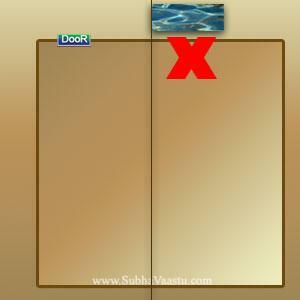 I want to know if Sump can come IN FRONT OF THE MAIN DOOR or not - Nadipalli Bharath - Bangalore City - India. -> Now a days the sites are very very smaller, in previous days house means one acre or half acre. Now sites become like a match box type size. The principles to the acre land may not be suitable to the 30X40 feet size plots. So for each and everything we have to broadly alter and adjusted, otherwise, people never build the houses. Water body or sump or well is good at Northeast, North or East directions. Water is precious and it is the time to store the water in all the places. Based on some restrictions we should minimize measurements. Water sump should not come at Southeast corner, South, Southwest, West, Northwest. Water sump is good at East, North and Northeast. Please observe the center line at this image, right side part is South direction of the site and left side part is North direction of the entire site. Here the water sump came towards Southeast part, it is not good. Here the water sump is exactly towards East direction of the site. This is not wrong, many houses have such water sumps and inhabitants saying that it is giving good results. Please note that even one inch also should not move towards South direction. Now water sump is came towards North direction, it may also called as Northeast-east water sump. The water sump South part is touching the center line of the compound. Now coming to the point, the water sump is came into the main entrance door. Now we are using the cement and closing the water sump with a proper lid with iron or slab or RCC. Now in this position, it may not harm the residents. Dust is not drive into the water sump. Further more now a days we are filtering this water again and again and after that only consuming. So no problem. If any body is serious on this issue, do the construct like this, and observe the below image. Then the problem solved. 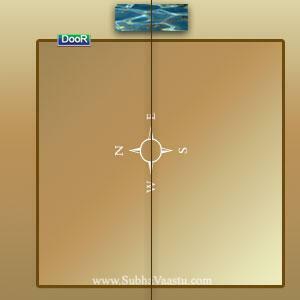 See the water sump little bit move towards South direction, now the water sump is called as Northeast-east water sump and it is not obstructing the door and pathway before the main entrance. Your purpose solved and followed the vastu principles. Please note that without expert vastu consultant don't d any practicals. Same also applies to the North direction properties. For your kind information, we are serving the water sump images towards North direction. Please observe the center line at this image, the upper side part is East direction of the site and lower side part is West direction of the entire site. Here the water sump came towards Northwest part, it is not good. Here the water sump is exactly towards North direction of the site. This is not a wrong method, many houses have such water sumps. Please note that the water sump even one inch also should not move towards West direction. Now water sump is came towards East direction, it may also called as Northeast-north water sump. The water sump West part is touching the center line of the compound. This system is good. Check the below image. See the water sump little bit move towards West direction, now the water sump is called as Northeast-north water sump and it is not obstructing the door and pathway before the main entrance. Your purpose solved, and followed the vaasthu principles. Please find the best expert vaastu shastra consultant and get recommendations from him. Protection is important for your water wells, wherever, they are constructed. otherwise it may harm to kids in the house, generally, children play games in compound premises, they are not aware of the surroundings when they were concentrated on playing if there is no lid or pitcher protection to the huge circumferential sump ... what happens. If there is flunkey, always following, that would be different. Check this image, and secure your loved ones from this big perimeter water sump. This protection will save everybody, while in our consultation in one village, we were seen an incident of boy fell down on water sump which does not have a secured lid. Another incident is, one dog fell down into the sump at night, throughout night it was barked and catches a small piece of iron rod inside and saved her life overnight, morning the owner called some people and they tried to pull up dog with rope, anyway finally it was come out and fell down on floor. we immediately gone to one nearby grocery store and bought 6 eggs, bread, milk, and biscuits and served it and her eyes were tore saying regards and thanks to me and all of us, it consumes the food hurriedly once it reaches to be feel that safe from her position, that is also a life, we are all happy when it was saved and secured. Perfect planning is required and too important in Vaastu shastra. Based on surroundings, structure, measurements, land elevations, air flow, building age we have to take the decisions in Vasthu shastra. 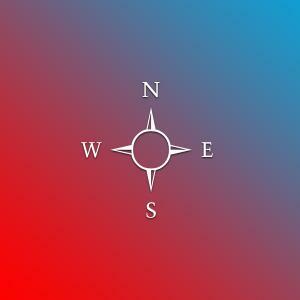 Vastu expert will help you in taking the right decisions. 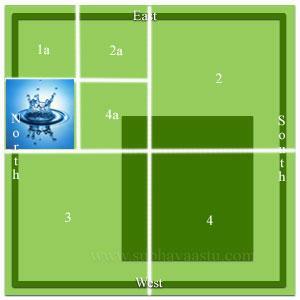 Always approach only one best vastu consultant nearby you. 1. 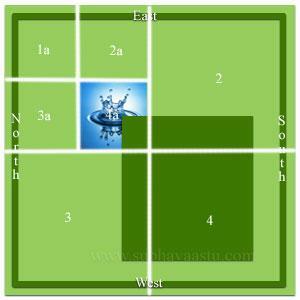 Water Sump at NorthEast Direction Placement: Overall Happiness, Hormany, and Prosperity. 4. 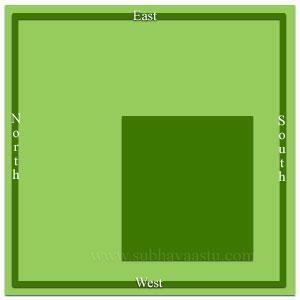 South Direction Placement: Mental worries, Loss in businesses, wealth loss, ladies may get serious health problems, sometimes loss of lady. 5. SouthWest Direction Sump Placement: Generally this placement may create violence, failures, wealth loss, many disturbances in the family may lead to divorce or break up. Deaths may be observed in this family, suicide attempts or suicides, accidents, Job lost, losses in business, collapse of enterprise, defame, chronic health deceases, mental worries, debts etc. 6. West Direction Placement: It may develop worries, health disturbances, Job loss, damaging with non-curable health disorders, sometimes loss of males or defame. 7. NorthWest: Thefts, Mental tensions, troublesome in balancing the life, always one after other problem raising, kids may be affected with this direction sump, losing money, Mental Tension, few times this water sump provides very good money and kept on the further investments and finally losing, litigation also increases. 9. Water sump at Center location: It may create destruction of the family, leaving the home with financial burdens or bankruptcy. Ours is a West facing the house, with the back door on the East. On the North-east we already have a bore well. We need to construct an underground sump for water storage. We don't have enough place to construct one, either in the North or in the North-east. We only have a place in the East. If we construct a sump in the East, it extends to the edge of the building starting from the compound wall. In that case, we would be stepping out of the back door only to walk over the concealed sump. 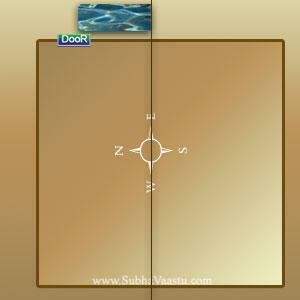 Please guide us in this context, as is this permissible in accordance with Vastu? Thank You - Deepthi Satyamurthy - Hyderabad - Andhra Pradesh - India. Dear Deepthi Satyamurthy Ji, thanks for your question. 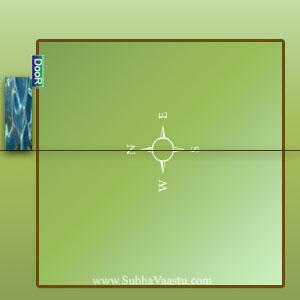 Nowadays we don't have such a bigger places to follow all vastu principles. 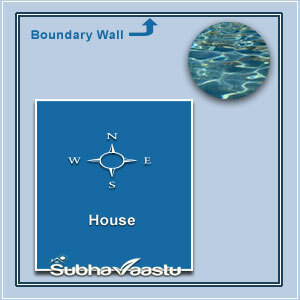 Vastu Shastra says that there should be a gap in between Water sump and building/compound wall, it should not touch either building wall/bedrock and compound wall/boundary wall. Please note that this rule was stepped in only a thousand years back, it was not framed nowadays and after the cement invented period. It was written only before cement invention. Construction with mud/lime stone/sand may not provide strengthen to the property, based on those days accommodating material, elders written that the water sump should not touch either main building and boundary wall and they framed. Question from George from Ernakulam: Hello Sir, I am building a house in Tripunithura and have a question. The earth wire pit is located in Kanni Moola (Southwest corner). Is it OK to go ahead at this place? Or should I move this pit to some other place? I would appreciate your early answer. Earthing means the connection of the electrical equipment to the ground or earth. The main cause for this earthing is to get protection from electric power shock and bypassing the maximum or heavy load to reach the ground. This is a semi-closed pit, it is not open to see the bottom where the earthing wire was placed at least level at the ground. If there is no earth wire system to a property, then there is a high chance for the power shocks and accidental issues observed. Earthing is too important for each and every property. The earth wire is connected to a plate or pipe placed inside the pit and was placed at bottom levels and covering with cement slab or wooden structure to make sure that it was properly placed and not disconnected with the pipe. Later we have to add or filled with salt, water, and charcoal, you are well known that the coal powder adds a perfect electrode conductivity & also acts as an anti-corrosive agent with this pipe. Salt plays like an electrical conductor. The good ratio of water has to be added to this earthing pit often to kept the good process always works earthing resistance in good control. Now coming to the point that all the above process there is no any whole vacancy in the pit. It was already filled with some items and was not kept open. So you may use this system or place or plan this earth wire pit at East or North because regularly we are using to add some water to it, though it may not be compulsory but it's good if we add water regularly. Northeast is not recommended, because it contains electricity which is said to be the fire in general. You may plan at Northwest or Southeast, if there is no such placement, then plan for South or West, the final one is Southwest. If you already dug the same at Southwest then do one simple thing, close it with one heavy slab or solid rock shown at SubhaVaastu dot com website. 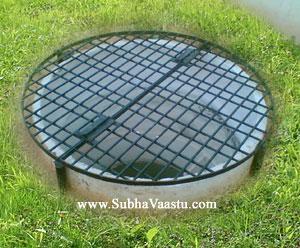 Water sump or septic tanks may be dangerous at Southwest as per vastu, but earth wire pit is not such a serious one. Anyway, generally, we are not recommending at Southwest parts for this purpose. This rainwater harvesting water storage sump is best recommended towards Northeast, through this one may not get digging level shown in this harvesting sump but the entire rain water collected at home may reach to the Northeast, this is a great logic and happy to know if the land was made up to get water collected towards Northeast. If it's not possible then one may plan to make it at Northeast-east or finally Northeast-north. We are not recommending the other parts of the home. Can I have South facing house plans from this website? 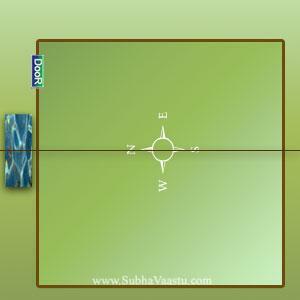 We are planning to start a Hotel, is vastu works for Hotels? What is Motels, what is the vastu importance in Motels business? 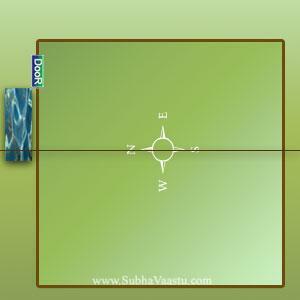 What is Surroundings vastu and what are its effects on Human beings? My friend is going to start Five Star Hotel at Singapore, need vastu guidance? My uncle wants to buy a plot, which is Northeast extended one, does he buy it? What are the vastu effects and how to prevent some issues through corrections? My friend is going to start a Dhaba hotel, is he should follow vastu for all construction? Dear sir, namaste, we are planning to buy a house facing northeast. But the major defect is there is a well in the southwest corner. Kindly suggest me the remedy. Can we close it. Your website is fantastic sir. 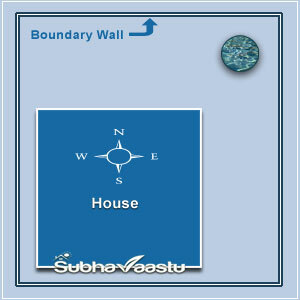 I have a boring outside my compound wall in the north east direction of of house.The water from that boring reaches inside my compound wall tank which is also on the north east border of my house i.e attached to the north and east walls of my compound.Is vastu correct? Sir can I place a borewell at SW corner from outside of my South facing plot. water trace in the site is in south east corner. Now shall i put bore well in this area. If i take the water in this bore what are the causes we have to face. sir, water table is available only in north of northwest only . there is no water table in northeast side.experts and water diviners told that this is the only chance to make borewell . but i m in confusion. give me a right suggestion to make borewell. very urgent. promoters advised me to take decision within two days before going to build a compound wall.plz do the needful. My home is south facing. we constructing home three floor. we are going to be in first floor. Hello Sir, i am having one 4acres rectangular (280ft *600ft) farm house plot. In that plot road is in the west direction. 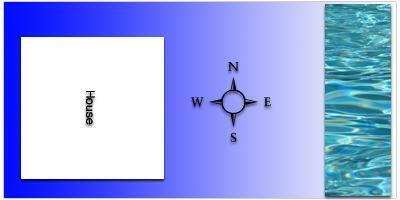 280ft is in the east-west direction and 600ft is in the north-south direction. I have made a compound wall for the entire plot but i want to make a house of about 50ft*50ft in south-west corner of the plot and i want to bore a well in my 50ft*50ft area of north-east corner. Now according to the total plot it comes in south-west. If i make a seperate compound wall of 50ft*50ft and make a bore within that compund. Is there any problem in that? Please give the answer. What are guidelines for plastic tank kept on foundation out side the house in open space. hello sir we have stair case on NE we r planing to dig a under ground water tank below stairs .before we have toilet on NE now we removed .please sugest. 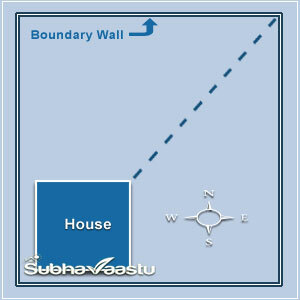 Our house is east facing and we have sump in north east direction but it is inside one of the room. Is it good to have water sump inside the room. Please guide us. water sump at north west corner, whether it is advisable??? I bought a constructed house built in East facing North on the plot. The builder has constructed the well at northern West corner, because space is not available in northeast. Please suggest, whether it is good or bad?. Do I have to close the well ?? Sir I constructed a house facing north direction. earlier I dig a well in northwest corner.but now not in use for house but using garden.for house I dig bore well in northeast direction and using. please advice it ok or not. water tank made of concrete placed on top of first floor roof in southwest direction please advice me ok or not. I have constructed a house in west facing plot. The builder has dig the bore in northeast corner, but water sump constructed at northwest corner, because much place is not available in northeast. Please suggest, whether it is good or bad?. What you want me to do?